Trying to decide what to finish your Christmas Dinner off with? 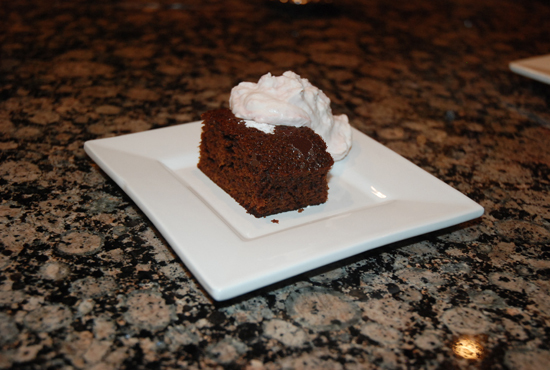 We love this Guinness Gingerbread with Cranberry Cream served “taster” style. Let’s be honest, by the time you’ve cleaned your plate of the turkey and fixins, you’re wanting little else than a comfy sofa to crash on! When you come out of the food coma, we think these little tasters are the perfect way to satisfy your sweet tooth.. a two bite dessert is just about perfect!! The addition of the cranberry cream versus the regular caramel sauce gives a wonderfully tart flavor that keeps this dessert from becoming overly sweet. Here we made it regular style in a pan…it’s fabulous both ways, dependant on the occasion! The recipe has 3 separate, but simple parts. 1.Combine the Guinness, molasses and coffee (if you’re not a coffee fan, easily omit this). The next simple “part” is making the basic cake. 2. In a separate bowl, mix together eggs, brown sugar and granulated sugar. 3. Whisk in oil into the combined sugars/eggs. 5. Finally, add this wet mixture to the dry ingredients. 6. Strain the cranberry sauce through a sieve. 8. Add a couple tablespoons of the whipped cream into the strained cranberry sauce. Slowly fold in the rest of the whipped cream! **just a note, this can be made ahead of time by adding Stabilizer to the whipping cream before you whip it. It will hold nicely for at least 3-4 hours..another do-ahead! 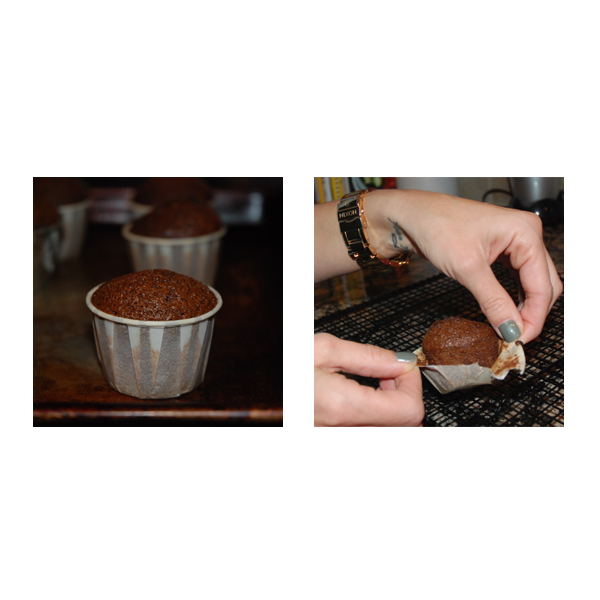 We like to pour our batter into these little disposable cups…make sure they are greased and floured…they make the perfect 2 bite sized gingerbreads!! Once slightly cooled, gently rip off the cups..so-o-o easy! Pretty them up by sprinkling icing sugar on and adding a generous dollop of the cranberry cream. Make sure you serve these babies warm..they have a slightly crispy top that you need to enjoy fresh outta the oven!! In large saucepan stir together Guinness and molasses and bring to a boil. Remove from heat and whisk in baking soda. Mixture will immediately grow larger and bubble up. Set aside to cool to room temperature. In large bowl, whisk flour, ginger, cloves, cardamom, allspice and cinnamon. In another bowl, whisk together eggs and sugars until well incorporated. 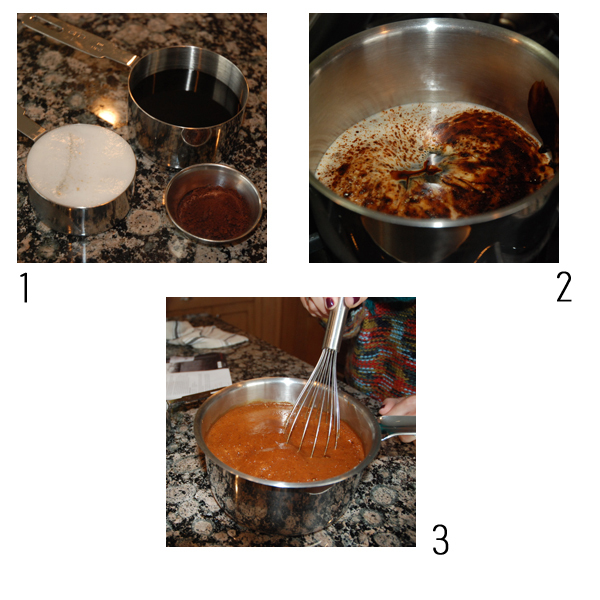 Whisk in oil and molasses mixture. Pour over flour mixture and whisk until just combined. Pour into prepared baking cups (which should be ready on a baking sheet). Rap on work surface to eliminate air bubbles. Bake until toothpick in center comes out clean, approx. 15 minutes. Cook cake in cups for 3 minutes and then tear away cups and let cool on baking rack. *If baking in a regular 9×9 pan, the baking time will increase to approx 35-40 minutes. Strain cranberry sauce through fine mesh strainer over a bowl, pushing on pulp with back of spoon. Discard pulp…should yield 3 tbsp of smooth cranberry sauce. In another bowl, whip together cream and Cointreau until stiff peaks form. 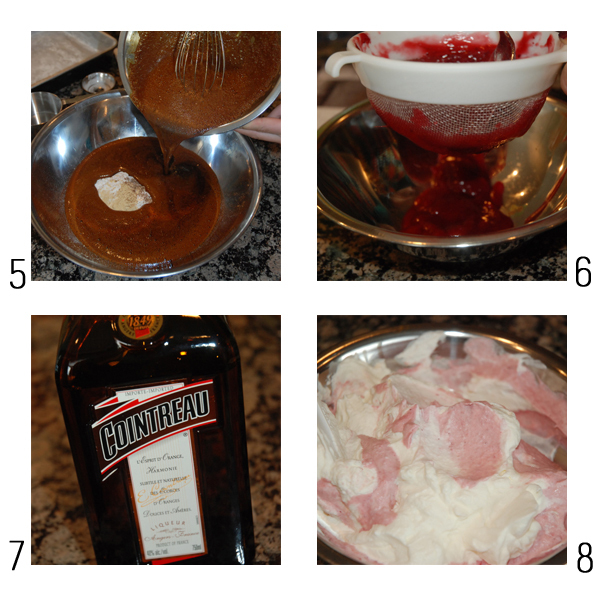 Stir ¼ of cream mixture into cranberry sauce until incorporated. Gently fold remaining cream into cranberry mixture. Refrigerate until ready to use. When ready to serve garnish individual gingerbreads with icing sugar and whipping cream. Gingerbreads are best served warm. 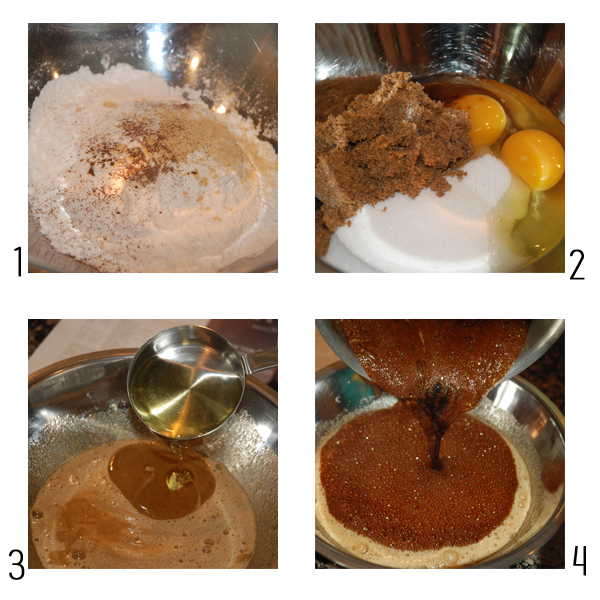 **Make Ahead: Gingerbread batter can be prepared ahead of time and placed in the baking cups until ready to be baked.